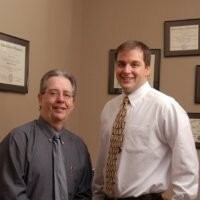 Munson Chiropractic was co-founded in 2004 by Dr. Dale "Doc" Munson, and Dr. Brandon Munson. Munson Chiropractic was founded with the idea of providing compassionate and wholistic chiropractic care to NW Arkansas. Over the last 15 years, the practice has grown and prospered adding new specialization in sports chiropractic to their extensive list of services. Though Doc Munson passed away in 2009, Brandon has continued the traditions began with his father and continues to serve the community he loves. Today, Munson Chiropractic is honored to honor the original traditions of chiropractic care while incorporating new innovations like ARP Wave Therapy and and DRX9000 Spinal Decompression. Brandon is a proud graduate of the University of Kansas (Go Jayhawks!!) and Palmer Chiropractic College in Davenport. He is married to the Brandi McKinney-Munson who owns and operates McGhee Insurance NWA and is the proud father of three sons. He has spent several years as a volunteer football and basketball coach in the area and holds the following certifications and memberships. If you would like to contact Dr. Munson or schedule an appointment, you may call our office at 479.254.1177. If you would rather send us a message, please click the Contact Us button.